This KBCS nature segment focuses on a small bird found locally, the Chickadee. 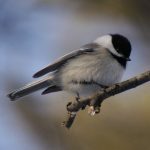 KBCS’s Yuko Kodama joins Ed Dominguez, Audubon Center Lead Naturalist at Seattle’s Seward Park, to find out about the unique characteristics of the two types of Chickadees found in the Seattle area: the Black-capped Chickadee and the Chestnut-backed Chickadee. Also included in the discussion is the fact that Chickadees actually add to their brain cell mass in the fall, in order to remember seed locations. In spring, their brains will shrink back.